BPDU Guard and Root Guard are enhancements to Spanning Tree Protocol (STP) enhancements that improve the reliability of the protocol to unexpected events. There are loops in this design that are implemented for resilience ie. STP will block a given path in planned operation but an alternate path can be activated if the primary path fails. However, STP is susceptible to various failures due to poor network design 1 or certain types of operational problems. 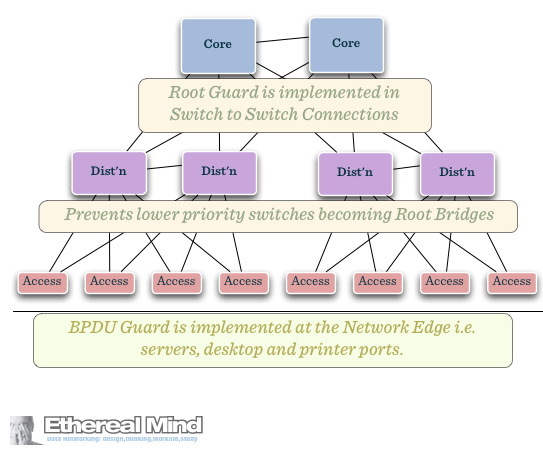 Both BPDU Guard and Root Guard are used to enforce design discipline and ensure that the STP protocol operates as designed. BPDU guard disables the port upon BPDU reception if PortFast is enabled on the port. This effectively denies devices connected to these ports from participating in the desgined STP thus protecting your data centre core. 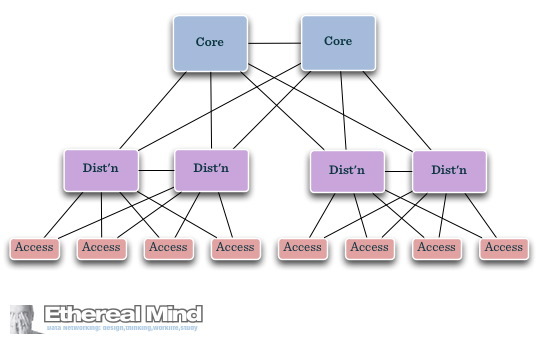 Because BPDU Guard and Root Guard are primarily to ensure design enforcement ( integrity / security) , they must configured in specific locations in the networks. I got the same doubt, what about loop guard? And thank you, your articles are excellent. If devices are not trying to become the root then how is it possible that root guard allow those devices to participate in the stp ?? They participate in STP for the primary purpose STP exists – loop prevention. The calculations still occur at that edge, and they do not need to be a root or secondary root for that participation to both occur, and matter.